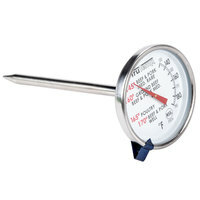 Ensure food safety with the Taylor 3504 4 1/2" TruTemp dial meat thermometer. 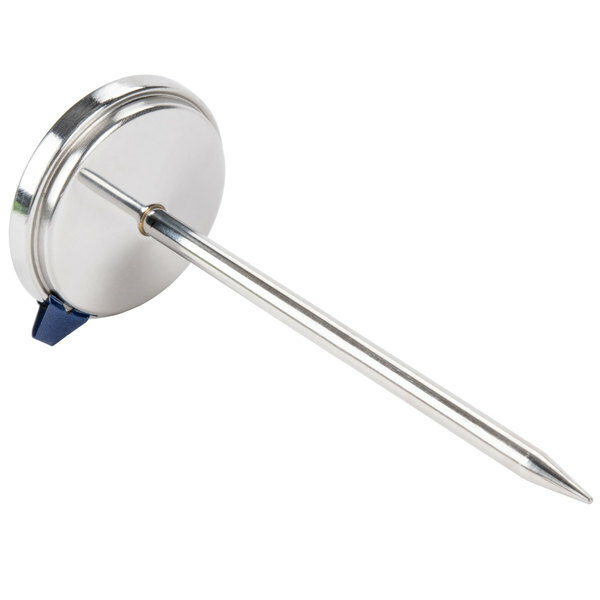 With a 4 1/2" stem length, this thermometer easily pierces meats and can be left within meat as it cooks in the oven. 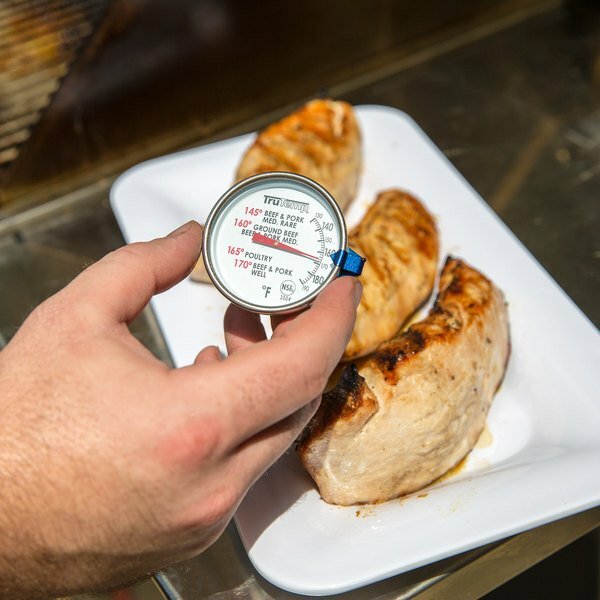 This allows you to quickly and easily monitor the internal temperatures of turkey, chicken, ham, and other meats. "Works really well. Perfect length for larger meats, love the addition of the recommended meat temps right on the display so that there can be no mistake." Its large, 2" dial face and bold, red indicator make it simple to read. It has a temperature range from 130 to 190 degrees Fahrenheit for superior versatility. With ideal cooking temperatures labeled on the dial face, this thermometer helps you ensure foods are cooking at the right temperatures at a glance. It also has a convenient indicator slide for quick temperature reference. Use this thermometer to ensure a consistent final product every time! This meat thermometer is a great tool to have it’s extremely accurate and will make all your cooking safe for your customers I recommend you use for all types of restaurants . 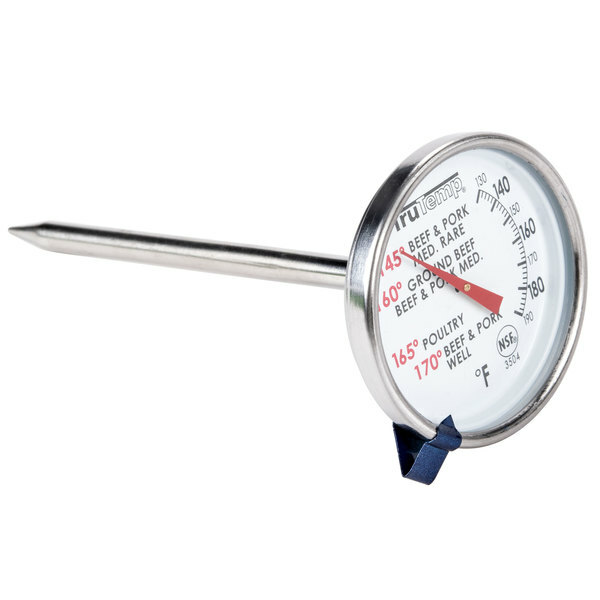 We use this meat thermometer for everything from baked chicken to grilled burgers and steak. The temperature is always accurate, and we love that it even shows specific foods next to their appropriate temperatures on the face of it. Oven safe makes this a perfect tool to have to cook the perfect roast or chicken. Unfortunately, the meter doesn't have temps below 130F so it is hard to know when to remove your roast if you are looking for rare or medium-rare without it carrying over too far. Otherwise, great thermometer to have. The Taylor 4 1/2" TruTemp Dial Meat Thermometer is accurate in reading temperatures and the dial is easy to read. It is versatile and durable. Recommended for any residential and commercial kitchen. 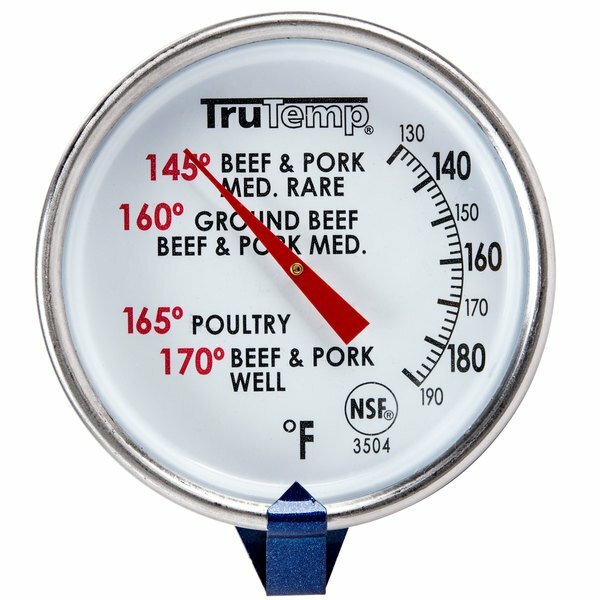 We do a lot of fried chicken to order in our business and this thermometer is great for getting the product done but not over cooking. It has an easy to read reference and the display is big enough for older cooks to see easily. 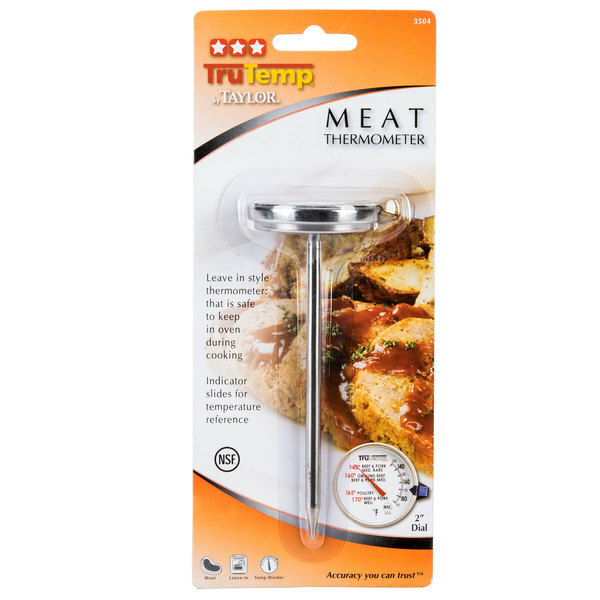 We enjoyed using this TrueTemp Taylor Meat Thermometer! It worked wonderfully on stuffed pork chops and even has a dial you can move to mark what temp you wish it to end up with and it can go INSIDE the oven and you can just check on it while the meat cooks which is very helpful. I highly recommend! I bought two of these to keep track of several dishes at once. I use to use the timer on the microwave but couldn't use the microwave while using the timer. These solved that problem. They are simple yet reliable. One of the things the health department looks for is that you have the correct thermometers on hand. This meat thermometer assures that your food is at the correct temperature. The dial has ideal temperatures for different kinds of meat on it and the packaging states this thermometer can be left inside the meat while it is cooking, which is helpful so you don't have to keep poking to check the temp. This is not a high quality thermometer, but it gets the job done! Has held up for 5 months and gives accurate internal temps. Price and durability were key factors in this purchase and have been as expected. Build quality is fair. Feels a little cheap like another cheap candy thermometer I bought on here. The good news is that it works and seems accurate. So for the price it's not bad. This meat thermometer works great if the probe is place far enough into the meat to get a good reading. Does not work really well with thin pieces of meat. Also watch the make sure the little marker on the side doesn't slip off and end up in your food. Works really well. Perfect length for larger meats, love the addition of the recommended meat temps right on the display so that there can be no mistake. 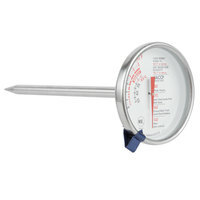 This is an easy to read large display meat thermometer. It is great to use on large roasts. Quickly provides an accurate reading. Unbeatable price. This is a large 4 1/2 inch meat thermometer! I like it because it is easy to read when you stick it in a roast in the oven! Quick temperature reading!! This has got to be the best price that I have ever paid for a thermometer, and the readings on this thermometer are very accurate. I use these meat thermometers to watch on my roasts while cooking them in my electric roasters. Sturdy, easy to read and easy to clean.